Finally, I have my results from Lesson 5 of Food Photo 101! I have to first say that having weekend time makes a big difference, and I hope others following along took advantage of having natural light. This time of year means I leave either in the dark or just after dark, and I get home after dark, so the only light I get is the good old plug-it-in kind. I have a window that gets great afternoon light right onto my dining room table, and I really liked how it worked out. Just a note about a bit of a difference I had with this lesson… I looked through a lot of my old photos along with the shots for this lesson, and I found that, even when I thought I was taking shots using the thirds, I’m off a bit. Of course, a bit here and there isn’t noticeable unless the grid is overlaid. But I found that with my stuff, I was using a slightly different ratio, I think, called the Golden Section. I’m not going to go into it too much, but the rule of thirds is a bit of a simplification of the Golden Section. It’s a ratio used since ancient Greece, and is supposed to be pleasing to the eye naturally. I think the reason is that it’s something I remember from school, and I just got used to using it then. There’s nothing wrong with the Rule of Thirds; I just found I missed it by more than a bit, but found I was hitting the Golden Section instead. 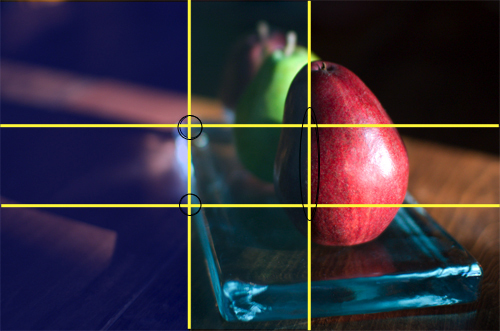 Some of my photos I pushed to the Rule of Thirds, but also included examples of the Golden Section. So what did I use for my photo subject? I went back to pears. 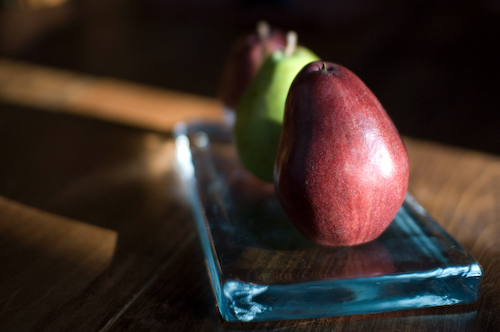 Is this because I think pears look great? They are kind of nice looking, I suppose, but it’s mostly because it’s the fruit I most often have around, especially in quantities of more than 1 or 2. The far left is all in shadow, with pretty much the whole section being empty space, with some shadow lines I found interesting. I also really lucked out with this glass slab; the light was hitting it ust right to have it refract along the back corner of the slab. Not planned, but I’ll take it! Also, I did highlight some parts of intersections that lend themselves to showing off the intersections just a bit: the back corner and the part where the refracted light starts. 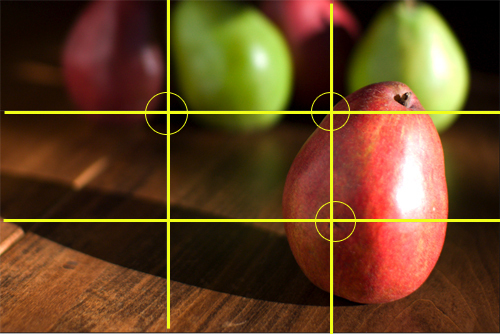 Also, the axis for the right side of the grid goes along the shadow on the front pear, so the middle section ends up being in shadow, but with the fruit in the shadow instead of being empty. 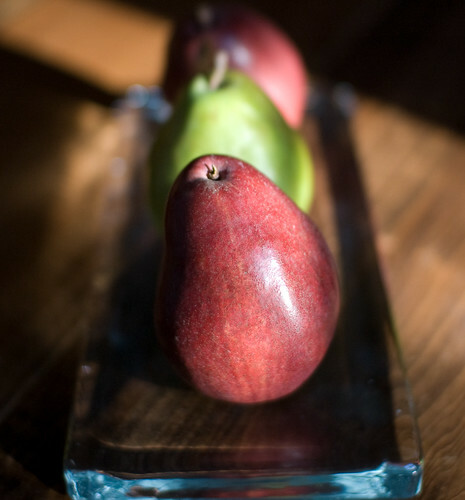 The right side is then mostly the first pear in natural light. Maybe not the best example, but I was happy with the shot. 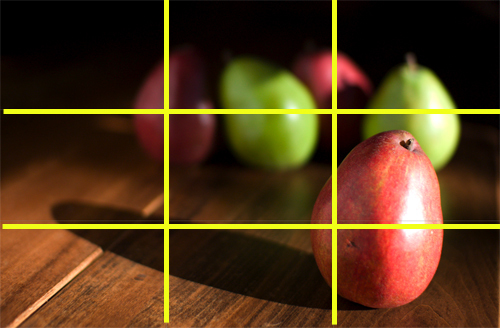 Nothing really fits well in the grid or on the interections, and it just looks like some pears on a table. The main point is a blemish on the pear in the lower right intersection, with the edge of the pear in the upper right, and a shadow between two of the pears in the background is in the intersection of the upper left. Light and shadow both can be used for proportion, I think. I also like that the background pears are mostly in the top third of the photo for some reason. I’m the first to admit I may be completely off base with this proportion stuff; for those of you in the class or just browsing, I’d appreciate any feedback, before Nika tells me how far off I am!